Hello, My JRT is an elderly chap, very spoilt. When ever I go to smooth him any where on his body he starts to scratch with his hind leg. Anyone have a similar problem. I have 2 Jacks and I teach in an area that is high in MANGE...I bring it home on my clothes and My Jacks have been treated twice...I am frustrated because I am back for the education season again. My Jacks don"t start scratching until I go back to teaching. However, when they see me watching them, they stop scratching and look innocent...like they didn"t do it. Please help...my Jacks have the best of care, but it has been very costly and frustrating...sometimes fearful. Your Jack is very cute! almost all dogs do this, believe it or not! they get itchy spots they cant reach or their skin is sensitive. It almost feels like someone rubbing your back and all of a sudden it itches like crazy. It probably feels like this to a dog and when we scratch it for them it is a natural reaction for their leg to start moving as if they were scratching it by their self. I know my one JRT has an itchy spot on her chest in the front and she cant reach it and when I scratch her chest her hind leg goes crazy! I think it is a natural reaction, it is nothing to be concerned about. 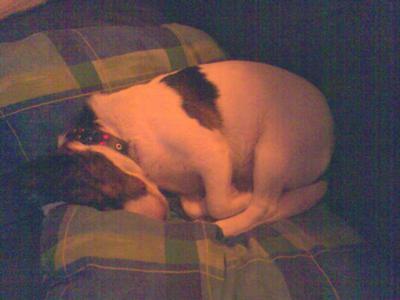 My jack Russell (female), does the same thing. I can't rub her down her back without her using her hind leg and scratching. I think that she has very sensitive skin. Just sensitive to touch. You aren't the only one out there.